Blitz the tomato, onion, carrot, celery together with the garlic, paprika, oregano and some salt and pepper. Bring to the boil in a pan and simmer for a couple of minutes while you make the bechamel. Melt the butter in a pan and whisk in the flour. Season and gradually whisk in the milk on a gentle heat. Add the bay leaf and nutmeg and cook for a few minutes until thickened. Blanch the potato slices in boiling water for two to three minutes. Drain and set aside. 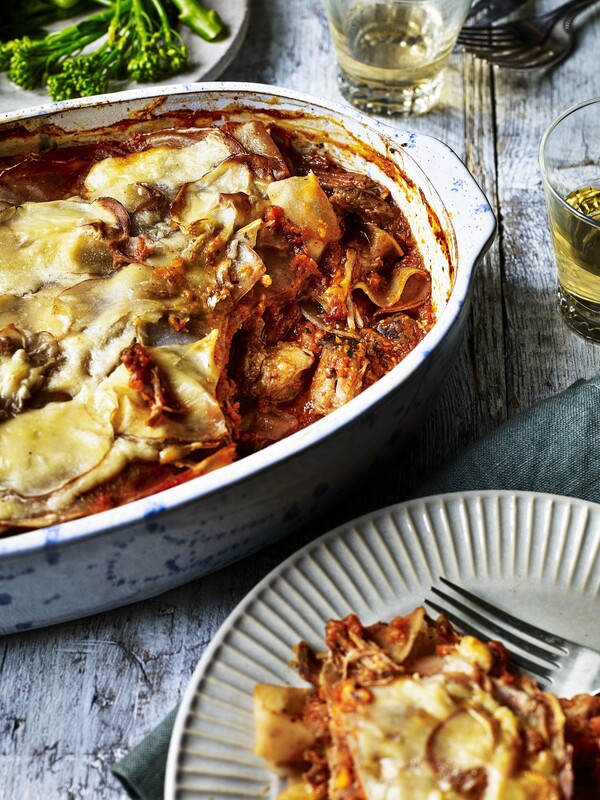 Line the bottom of a lasagne dish with a layer of potato followed by half the pork and half the tomato sauce. Top with some bechamel and repeat with another layer. Finish with potato and bechamel and a good grating of Parmesan. Bake in the oven for half an hour until golden on top. Serve with buttered shredded savoy cabbage. 500g leftover cooked roast pork shoulder, shredded 1 tin chopped tomatoes (400g) 1 red onion, chopped 1 small carrot, chopped 1 celery stick, chopped 1tsp garlic paste 2tsp smoked paprika 2tsp dried oregano 3 large red potatoes (about 550g), finely sliced lengthways 50g flour 50g butter 300ml skimmed milk 1 fresh bay leaf A grinding of nutmeg Salt and pepper Parmesan, grated, to top.